Raccoon Proof poles have Raccoon baffles below to block Raccoons from climbing up the pole. These Bird feeder poles that block Raccoons make Raccoon and Squirrel Proof Bird Feeders. Their baffles are larger to block larger animals like the raccoons. Don't let them frustrate you, get a good solution and enjoy feeding only the birds! Bird House Pole With Baffle features a sturdy metal, rust resistant design, sure to hold up to even the largest and heaviest birdhouses and birdfeeders. 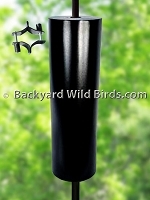 Includes pole baffle, a heavy duty auger and a bird house mounting plate with screws. Post Raccoon Baffle and ground socket are great together. 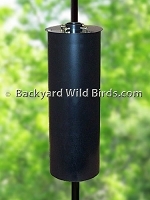 The Raccoon Baffle is excellent at stopping raccoons from climbing the standard 4x4 post. Post Socket Ground Mount is a tan twist in the ground socket for a standard 4x4 post. It can be screwed into the ground 20" and allows the 4x4 post to be above ground. Raccoon Proof Bird Feeder Pole with 4 hanger arms and a large cylinder raccoon baffle that is made to squirrel and raccoon proof bird feeders hung above it. Say good bye to raccoon and squirrel problems forever. Raccoon Proof Bird Feeder Pole System has four hanger arms with 3 bird feeders and a large cylinder raccoon baffle that is made to squirrel and raccoon proof the bird feeders above it. Raccoon Proof Bird Pole 6 Arm is Bird Feeder Pole with six hanger arms with a large diameter raccoon baffle that is made to squirrel and raccoon proof bird feeders hung above it. Raccoon Proof Bird Pole Quad is Bird Feeder Pole with four long hanger arms with a large raccoon baffle that is made to squirrel and raccoon proof bird feeders.